More than 2 years ago I positively reviewed this slim floorstanding tower from one of the main Italian loudspeakers manufacturers, Aliante. The CNM Tower - since then - has been factory upgraded by means of new tweeters and crossovers. Every manufacturer claims "Technical specifications may change without notice" but, actually, it is a common practice to release a mkII or "improved" version when significant changes are applied to a model. Less than serious manufacturers only apply cosmetic and negligible changes and claim to have released a "completely new product", forcing their customers to buy the new, better model. This attitude, of course, makes the second-hand prices go down rapidly as soon as a new model is released. Not so the folks at Aliante. You won't find a CNM Tower mkII or "improved" or whatever. The model name remains exactly the same, but the loudspeaker has been significantly modified. Now, you may expect to be forced to spend big bucks to put your hands on the new version...wrong! You can simply buy the new tweeters and crossovers at factory prices (75 Euros, all inclusive, if you send back the old drivers) and install those on your own or have a friend soldering the stuff for you at a cost of a pair of beers. As said, the upgrade consists of new tweeters and crossovers. More precisely, the new drivers have a beefier magnet, a larger (almost 4 cms!) and softer dome. The bigger magnet, now of the shielded kind, is also slightly more powerful than the previous one. The membrane of the driver uses a better and softer material with a different surface-treatment. The new unit forced the manufacturer to change the crossover network, as well. The new one uses a different attenuation resistor for the tweeter and even the crossover frequency has been modified. 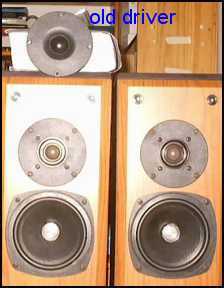 Now the midwoofers reach a slightly higher frequency and the two emissions (woofer & tweeter) overlap for a larger portion of frequencies. The original crossover scheme has remained the same. As you can guess from the remarks above, you can't simply install the new tweeters...you MUST install the new crossovers as well. The work is easy and all you need is a soldering iron and a couple of hours of spare time. The new tweters magnets, being slightly larger, don't fit into the old cabinet holes so you need some "manual" work to enlarge those. If I may suggest the obvious, enlarge the holes by small "amounts" and try fitting the new units each time until you find the "perfect fit". Solder the cables to the new units and you're done. Installing the new crossovers is even easier: just unsolder the old and solder the new ones. Mark the wires with color codes to avoid mistakes. The Aliante CNM series make use of braided CAT 5 inner wires so if you're not familiar with the kind of "pairing" which has been adopted you'll be home and safe with color coding by means of a permanent marker. If this is the first time you "play" with these things, take all the time you need and be extremely careful. Working with wrong tools and/or unappropriately may permanently damage the crossovers and/or the tweeters. First of all, let the new drivers break-in for at least 20 hours. They just need that. If you've already read my previous review of these speakers you should be aware of their sonic character. One of my (albeit few) complaints was the questionable level of transparency and accuracy of the mid-high range. The new drivers represent a partial answer to this problem as they sound much more detailed and refined than the old units. The high range is smoother and harmonically richer while the mids are somehow fuller, perhaps thanks to the larger overlap between mid-woofers and tweeter. The bass range, as one can guess, has remained the same, quite deep and powerful considering the size of the mid-woofers and of the cabinet. Another parameter that has been greatly improved is the ability of the speaker to "disappear". The new ugraded CNM Towers can create a good 3D virtual soundstage and, even better, they can acoustically disappear, so much that it is hard to detect any sound coming directly from them. In my listening room this "magic" angle was something between 30 and 40 degrees...but your mileage may vary depending on room size and position of the loudspeakers. Before ordering the upgrade kit, check the size of the old tweeter baffle and the shape of the crossover/binding posts box. Describe your situation to your Aliante contact/dealer as different tweeter baffles and crossovers have been released during these two years. Be sure you buy those that fit into your old cabinets. If you're not 100% confident with your DIY skills, ask someone in the know to do the work for you. For a trained technician or skilled DIYer a couple of hours of work are more than enough to get the job done. Be careful when handling the new tweeters as the dome isn't recessed into the baffle so placing them facing towards your work desk may damage them. Aliante supplies plastic washers to avoid this...but one never knows. Better to be safe than sorry. If you already own a pair of CNM Towers with serial number < 935601 this upgrade is the best thing you can do to your HiFi system. For 75 € you simply can't go wrong. Ask your local dealer for details or contact Aliante directly, I'm pretty sure they will be friendly and helpful. I wish other manufacturers will behave the same, supplying their customers with upgrades at reasonable prices. Hats off to Aliante!